Tom Maker has long been known as a great amplifier designer. His series of Edge amplifiers won numerous awards as well as many critical accolades. Now he is back with an even better line of amps, under his own name. On the road to rethinking his amplifiers, Tom also put a lot of thought into the loudspeakers they might be connected to. In the process, he created a groundbreaking series of speakers, too. 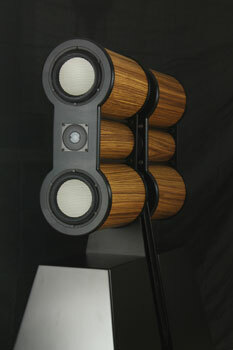 To begin with, it's better to think of Maker Audio's speakers as high-fidelity systems rather than just speakers. Each one includes a built-in amplifier to power the authoritative subwoofer, as well as digital signal processing circuitry to allow the speakers to sing in even the most challenging rooms. But that's just the beginning. Options include built-in amplifiers for the mid/bass drivers and tweeters, as well as built-in high fidelity music streaming capabilities. Imagine: A stereo "system" that includes just two Maker Audio speakers and a remote source — anything from your phone to a dedicated music server — wirelessly streaming your music. No need for racks full of hardware, interconnects and speaker cables. But all this technology would mean little if the Maker Audio speakers did not create a sense of realism rarely found in home high fidelity systems. What a perfect way to end a long day or enjoy the weekend — being enveloped by the sound of your favorite musicians. Whether it's the delicacy of a chamber group or the power of a rock band or full orchestra, the Maker Audio speakers will let you experience your favorite music in a way you've never heard it before — and with an ease you will not believe. Download the current price list for speakers and options. Maker Audio is not affiliated with AVID or M-audio products. Copyright (c) 2012 Maker Audio. All rights reserved.